The art of singing is constantly evolving and reflecting our changing world, proving the importance of versatility for opening oneself to other cultures and styles, enriching the experience of communicating with the human voice, and most importantly, enjoying more opportunities for professional performance. While singers explore the myriad ways to communicate emotion and ideas, they experiment with different timbres, instruments, languages, and musical genres. As situations vary, the demands on the voice as a musical instrument, and the act of singing itself, must be modified. 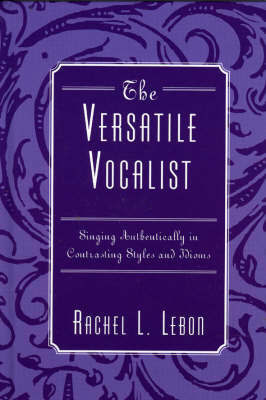 In this follow up to her 1999 volume, The Professional Vocalist, author Rachel L. Lebon continues to give expert advice on the singing profession, describing the musical and vocal adjustments essential to becoming a versatile vocalist. She addresses proprioception, the kinesthetic feedback, vocal adjustments associated with 'crossing over' and exploring new sounds and styles, and performing authentically within contrasting performance situations. Many facets of performance are considered: differing venues_from small studios or clubs to large concert halls; singing acoustically or with sound reinforcement; singing in various styles of music_be it commercial, popular, jazz, or classical; and varieties of instrumental accompaniment_whether a single instrument, a small ensemble, a full orchestra with strings, a big band with horns blaring, or rock bands with wailing guitars. The book discusses factors that influence vocal approaches, including recording studio technology, live sound reinforcement, speech, language, and microphone styles and their affect on musical genres. Practical aspects of music preparation, song learning, rehearsal techniques, and achieving vocal longevity are given, as well as 'real world' strategies and advice from Lebon and other working professionals.